George Stant of Connersville, Indiana began, his business by repairing bicycles in 1898, followed by the founding of The George Stant Machine Works. Early activities included blacksmithing, a brass foundry, developing and making machinery to produce piano tuning pins. Stant invented and patented an axle setter in 1904 for straightening rear axle shafts and a transmission for the rolls on a player piano in 1916. Later in the twenties, the Company began manufacturing aftermarket automotive parts including a radiator cap to help prevent the theft of Motometers. Stant soon began producing the accessory “Quail” radiator cap for the Model “A” Ford and radiator mascot caps for other Automakers. In the early-1930s George’s son Kyle Stant invented and patented a locking gas cap, and at that time the Company was also manufacturing and supplying a number of different parts for automobile manufacturers. Radiator cap with spring loaded pressure release valve for higher coolant boiling temperatures. 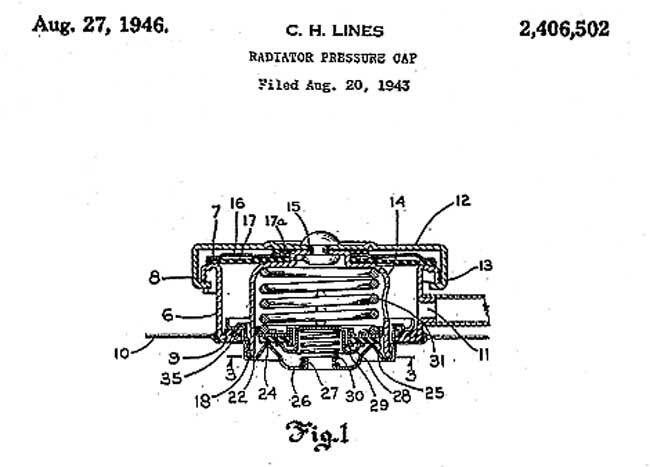 The patent drawing above contains a modern type of radiator pressure cap and radiator filling opening that was granted to C.H. Lines in 1946 for the Stant Mfg. Co. This device allowed the engine coolant to be pressurized which in turn raises its boiling point. Equipped with an internal spring-loaded valve that opens at a set pressure, it routes boiling water and steam out through an outlet (#11) to the overflow tube during overheating. This cap met the needs of then-current engines and allowed for the development of higher compression ratios and increased horsepower in post-war engine designs. Stant USA is the companies name today and it has expanded overseas and its primary products are radiator caps, inlets, gasoline filler assemblies and vapor canisters for automakers worldwide. The expandable image below of the Stant machine shop was taken in the early-to-mid teens. A circa-1911 car by an unknown maker that is converted into a truck and an early Indian twin are out in front of the shop. Tells what you find of interest in this photo courtesy of the Indiana Historical Society. This entry was posted in Auto photos 1885 - 1920, Motorcycle photos, Uncategorized and tagged 1910s Lexington Car, George Stant Machine Works, Harley-Davidson, Model A Ford Quail radiator cap, motometer, player piano, Stant MFG Co., Stant radiator pressure cap, Stant USA. Possibly a Locomobile? The shape of the engine compartment and the overall frame lines remind me of a Model 48, there’s something written on the radiator that looks the right length for Locomobile, and the wire frame across the front looks like the headlight supports that Locomobile used. Steve, good thought – I know a lot about Locomobiles and this car was not made be them. The radiator though resembles a Stoddard-Dayton, but that brand always had straight-sided units. Yes, if I had finished my coffee before checking today’s picture, I’d have reconsidered the likelihood of a non-local luxury car being cut down to a truck. I just noticed there’s a sign on the truck. 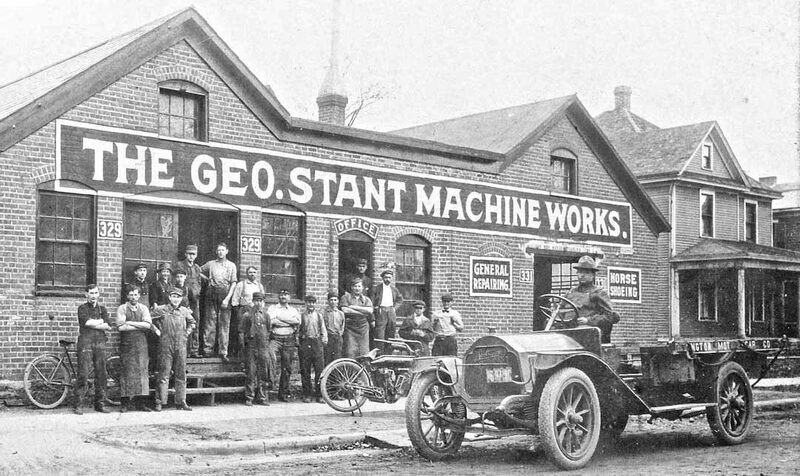 The legible portion is “NGTON MOT AR CO.” From 1910-1927, Connersville was home to the Lexington Motor Car Company, located at 800 West 18th Street. I haven’t seen any identified images of a Lexington earlier than 1915, but their Thoroughbred Six of that year had the same type of headlight brackets as the truck here, and it’s possible they were used earlier. maybe a first. I always wanted a Lexington Minuteman from the ’20’s. Who did what? 5th man standing form the left in front of office door could have been a blacksmith. Mabey even an amateur boxer on weekends. David, hope you are staying warm in the frozen north! Love anything with old motorcycles! The v-twin looks to be around 1913 or so?? Anybody that frequents this site, surely has seen the name Stant. ( Sometimes flying through the air with cloud of rusty water following it) It always interests me where all these parts came from. If you feel America has lost it’s way, it’s because years ago, cars ( and trucks) were “assembled” units, meaning, they got parts from all over the country, and assembled them into their cars. It’s what made America hum. Auto parts, like anything today, come from all over the globe. I always look at the parts origin, and it’s not always China. To go back now, would devastate the world economy, but back then, every country made their own parts, and employed millions of their own countries people. Things sure have changed. Thank you on the history of something as menial, yet instantly recognizable and important, as a radiator cap. That truck puzzles me. It almost looks like it started life as a 1910-11 Packard Model 30, or as a Stoddard Dayton. Almost, but not quite. The rad pressure cap reminds me of a home-made tool I saw years ago in a small garage. They had a regular pressure cap with a long piece of tire valve stem sticking out where the rivet usually goes with a nut holding it in place. They used it to check your cooling system using a shop air hose. The cap kept the pressure at 15 pounds while they looked for the leak. Never seen another one like it. Sure beats that expensive tester with the hand pump. Anybody knows just how it was made? I agree with Leyden and Robbie, the truck is an early Lexington. There is a picture in The Standard Catalog of a similar model, taken from about the same angle. Note also the helper springs that have been added on the front axle. I guess in that era a lot of truck drivers got wet when it rained. Talk about hedging your bets! Stant still offers horse shoeing, just in case automobiles and motorcycles turn out to be passing fads. That motorcycle is not an H-D. It might be a Yale or Emblem or another obscure make. Jon, Yes you are correct, after checking it was apparent that all the early H-D twins have flat=sided tanks. The motorcycle is an Indian single, from 1909-11. I can’t see enough detail to give a better date. It is an all-chain drive single speed, with a battery ignition. Per Jerry Hatfield’s Standard Catalog of American Motorcycles 1898-1981, my best guess is that the motor in question is a 1911 Indian “Regular” single-speed 7 hp twin. I’m going off the tank and frame shapes, the seat angle and handlebar design, and the bicycle-pedal starting system seen in the photo here, and what I can make out of the engine configuration. Yes, it is an Indian single. You can just make out the Hedstrom carberator in front of the cylinder. The motorcycle is an ’11, or ’12 rigid frame Indian single. 1913 was the first year for the swing arm frame, although the rigid frame was still available. It’s also a battery ignition model (no magneto) as you can see the dry cell battery container in front of the motor. This was probably the lowest priced Indian, but still lots of fun, and plenty dangerous! The Stant products are like Home, God , Motherhood & Apple Pie, to me . I am grateful the these products have assisted in the many years of making the older cars & trucks just that much more reliable. Rusty hot water puke-ing out of a radiator overflow tube, usually isn’t the fault of the Stant cap product. It’s either the wrong (Stant) pressure cap PSI for that application, — or something else in the cooling system or the engine, is wrong, — which can also include some form of lack of maintenance or a neglected repair that is required . Reading the warning on the Stant cap is very good advise!!! Edwin W.
Stant also pioneered radiator ornaments. I visited them many years ago and I believe their designer said whippet was their first mascot in the mid 20’s. They made it big when they brought out the Ford quail for the model A in 28 and continued with the quail through 32. In 34 they brought out the Ford Greyhound and they designed a greyhound incorporated with the V-8 hood emblem for 35 but Ford didn’t buy it. They then came out with an accessory greyhound for the 35-36 Fords. Their mascots were cast by Jarvis in Toledo. They made mascots for many cars. Did Stant by chance make the “Griffin ” radiator cap for Gardner of St. Louis? The Griffin is in my opinion the most unique of radiator caps. I believe the runnng greyound “mascot” radiator cap was first seen on early Lincolns (after Ford bought out the company) and they certainly are part of ther original heritage seen at fine conours events. But aftermarket accessory guys in later years adopted it as a sort of affectation of their custoized early Ford V8s of the early 1930s. A bit tacky to see on a Ford, but still nice to see once in a while if the Ford is a beautiful example. It does show the owner’s personal pride of ownership doesn’t it?